Opulence by Gabor is a fresh, chic, precision-crafted, dramatic graduated bob—without bangs! 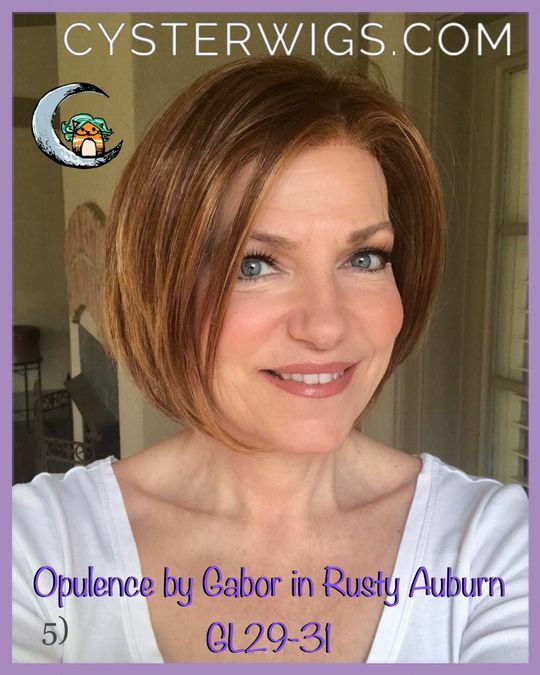 Opulence by Gabor is silky-straight and has a 100% hand-tied monofilament part combined with a sheer lace front for natural, off-the-face styling. 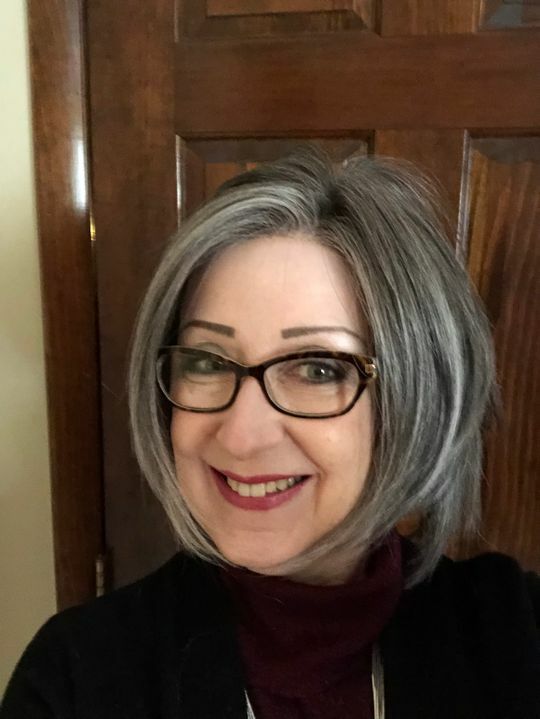 This subtly layered and expertly tapered chin length page includes a side swept front with sides that angle up to a short nape. Holly K. Reviewed by Holly K.
I ordered Opulence in GL44/51 Sugared Charcoal. I was so anxious for this one after seeing Kathleen Ryan review it. The shipping from Cyster Wigs was exceptionally fast because it shipped from GA. Thank you Heather and staff for a wonderful experience. I’m always impressed by how nicelyGabor products are packaged. I fell in love with the color right out of the box. This shade of grey is so similar to my greyed bio hair. The fibers felt and looked wonderful. I popped it on my head and it was love at first sight! I always trim a fringe into my wigs because FFA has taken all my brows and a fringe obscures my created brows but this lace front was so impeccable that I left it as is. I was so pleased to find that not only is this unit beautiful but it’s totally comfortable. Opulence takes a place in my top three favorites. P.S. Cyster Wigs also wrapped this in a pretty spring print tissue paper. What a nice touch! Loveeee this short angled bob. Natural density..little permatease...the length is flattering in the front and short in the back..perfect for sumer. Rusty Auburn is a natural medium brownish auburn. A very realistic color. The lacefront and mono part are very well done. 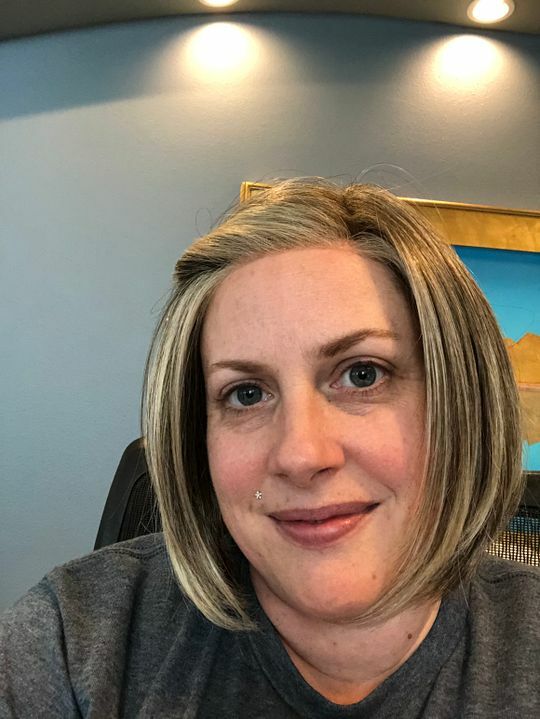 If you want an alternative to the HD fibers of Ignite by JR and want a mono part as well Opulence is a wonderful option...I highly recommend her and CysterWigs. Just the right length and sass! I love it! Holly D. Reviewed by Holly D.
I loved the cut and style of this wig- that's why I was so sad that the color just didn't work for me. I wish Gabor had some cooler rooted blond shades (like RW shaded biscuit) to choose from. If you like Gabor and already have a favorite color(s) I would definitely recommend this wig! Lisa L. Reviewed by Lisa L.